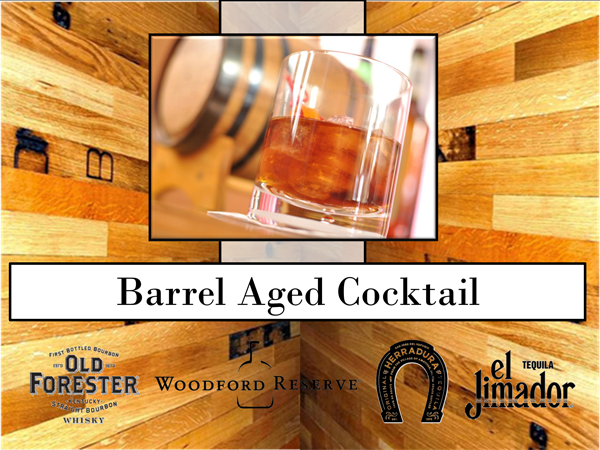 What goes into a barrel aged cocktail? Let us show you! And be sure to make plans to try our barrel aged Manhattans during our Grand Opening on November 13 & 14th. 1. Prime Your Barrel: Before pouring liquor into it, you need to prime the wood so it doesn’t leak. Fill the barrel with hot water. This will make the wood expand, filling any space between staves. (This may take a few hours.) Then empty out the water. 2. Choose Your Cocktail:Pay extra attention to anything utilizing citrus (it may spoil). 3. Barrel It: It’s best to premix the cocktail, without ice, so you know you’re not shorting any of the ingredients. Pour the contents into the container, give it a few stirs and, using a funnel, pour the cocktail into the barrel and plug it. Store it in a dry, temperate place for one – six weeks (Depending on the size of your barrel) Turn or shake the barrel every other day or so. 4. Taste Test: After one week unplug the barrel and taste the cocktail. Look for notes of caramel and vanilla. If it’s not aged enough, let it sit for another week, tasting it along the way. And when you think it’s good and ready bottle it. 5. Bottle It: Pour the cocktail into a large container using a mesh strainer to filter out any char from the barrel. Then, using the funnel, pour the liquid into several blank bottles. 6. Drink Up: Once bottled, stir the cocktail with ice and strain it into a glass and . . .
You can try our barrel aged Manhattans at our Grand Opening November 13th and 14th!